Now everyone has had time to digest all of the information from the Esri User Conference, it is time to start filling you up again. While presenting and meeting users we realized that we could run for a week just talking about all things ArcPad. One item that seems to be a sleeping giant is QuickProject Templates, especially the DEFAULT template. 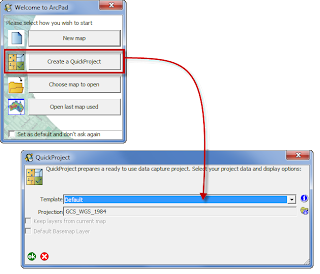 One of the key features of ArcPad is that you have the ability to create ad hoc data while in the field, but with the default QuickProject you can also customize the data to better relate to your collection requirements. We are going to run through an example where we have a Side Entry Pit (SEP) inspection to evaluate how much cleaning is required before the winter season kicks in. • Edit the QuickCapture tab in the Table of Contents. Creating a QuickProject is super easy, well in fact every step in this article is. 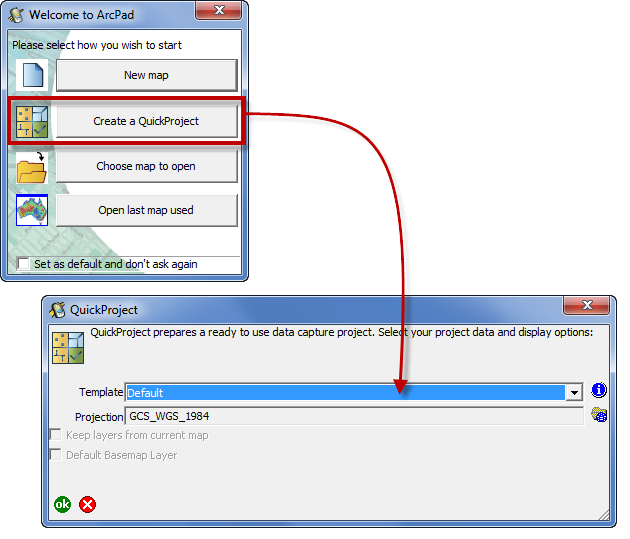 When ArcPad opens, by default, you are prompted with four options and the second is Create a QuickProject. In the “Template” drop down menu have a look to see the different templates available but select the leave Default selected. You will also see that the projection for the QuickProject is listed. If this is not the projection you require for your project, you can press the blue map icon and select a different one. When you press OK, three shapefiles are made for you – point, line and polygon and they are stored in “My Documents” in a folder named QuickProject_TimeStamp. There is everything you need to get started, even an ArcPad map document (.apm). 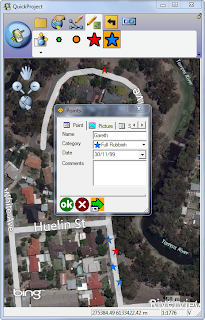 As you are a starting a blank project, there is obviously nothing contextual in the map, so you can add your own reference data now or simply add an ArcGIS Online Base Map (this requires internet capabilty). You will notice the QuickProject opens automatically to the QuickCapture toolbar so you can just start editing. There are three symbols per feature class shown and this can be changed dynamically as you work. Because I am creating an inspection project, at this stage, I only see myself needing to work with point data. In the Table of Contents, I am going to activate the QuickCapture tab. The very cool thing about this toolbar is that it represents every symbol category as its own feature class (this is an important note to remember). I have turned off all of the lines and polygons along with adding the two other categories for the points. I don’t know if I’ll need them yet - but let’s turn them for now. It should be noted that label here is purely the Mouse hover tool tip. Feel free to change this if you so desire. I will come back to this. Now let’s have a look at the point layer and set it up. The symbology tab shows that the data has been created with unique values categories (wow just like ArcMap). 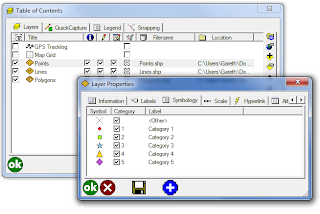 You will see the symbols, category (coded value domain) value and label (description). All of these are editable. 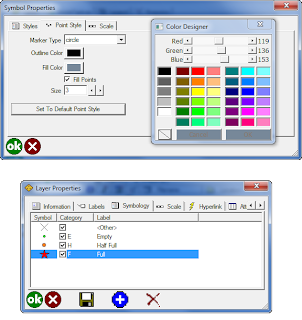 To apply the symbology, click on the icon and the Symbol properties dialog appears. Go to the Point Style tab and press the “Set to Default Point Style” button to activate the controls. 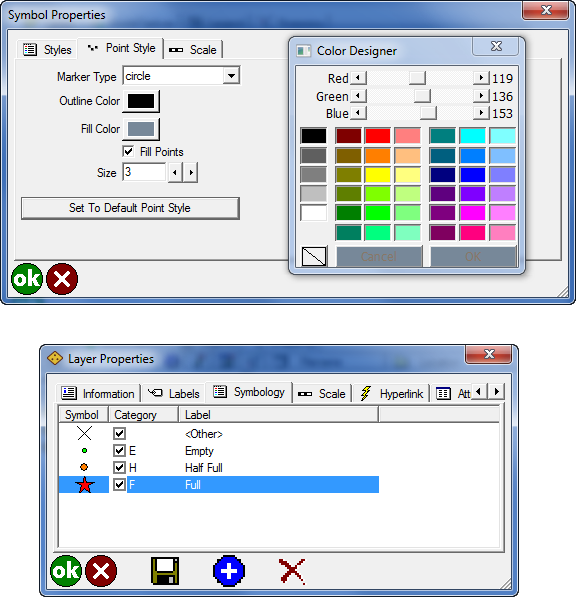 Select the Marker Type, Outline and Fill Color and the Color Designer will appear. Set your size for each and you’re done. Now select the category value and set it accordingly along with the description. As I only need these three categories, I deleted the other two. The delete button is only present when you have selected a category. If I want to add another category later I would come back to this dialog and press the Add button and set up the contents as mentioned. How do you like that for a focused data capture application in less than 10 minutes? 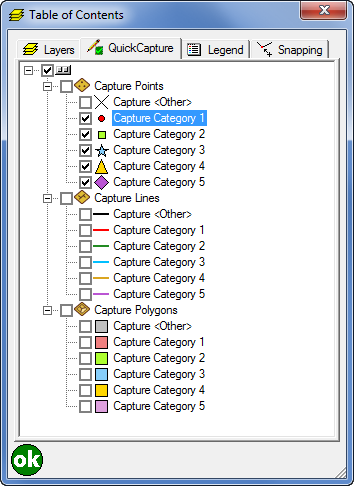 Having a quick look at data capture, we want to start at the QuickCapture toolbar. 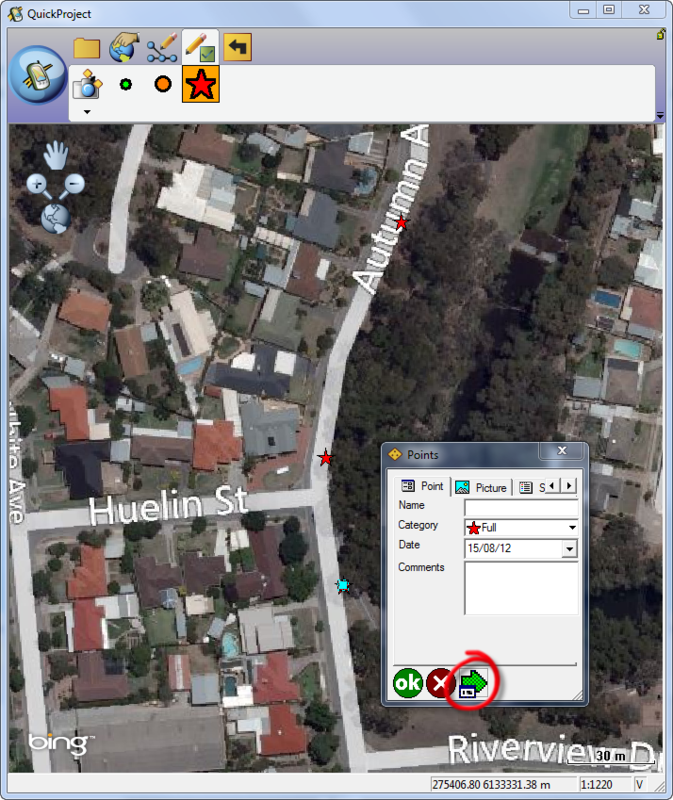 Moving down a street I can simply click on the appropriate tool and add the feature/inspection. The feature dialog opens and you can see that the Date and Category are already populated. As there is a name field I will use that and populate it, but I don’t want to have to keep typing my name each time. Clicking the Repeat Attributes button (the big arrow on the bottom of the form) will maintain the attributes for the Full category. Remember that important note I told you about earlier, that’s right about each category acting as its own feature class. Well this is one of the powerful reasons for that. Let’s run through another example. While traipsing around the streets I have found that when the SEP is full it is normally with leaves or general rubbish. In the comments I have to keep changing the text from Leaves to Rubbish, so that is not helping my rapid capture of data. Solution: create a new category to provide two QuickCapture buttons. 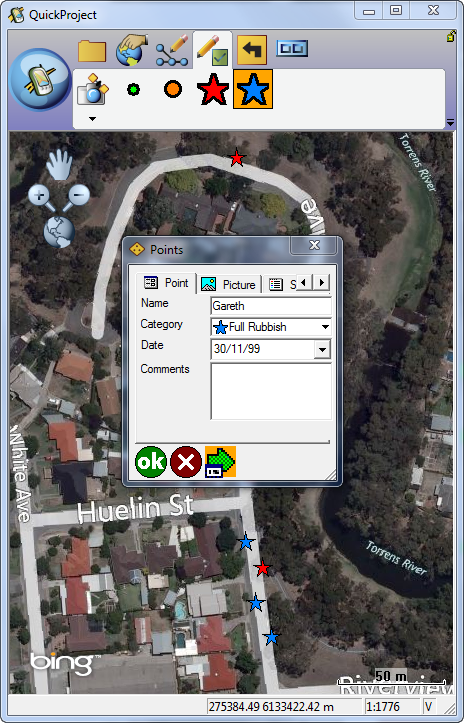 Back to the Symbology tab of the Points layer properties and the category Full Rubbish is created using a big blue star. As a note I also made a change to the original Full label to show it as Full Leaves. The final step is to check the category ON in the QuickCapture tab of the Table of Contents. 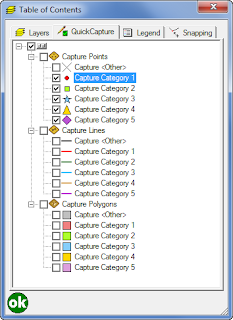 Using the new capture category, I need to fill out the name again and press the Repeat Attributes button so that my data is being pre-poulated. In fact, now I have found that I don’t even need the form to collect the data. I wish I could turn it off. Oh wait - I can! Back in the Table of Contents I can turn off the ability to show the form during data capture. All the attributes will still get written, but if I don’t need to see it - why should I? So now all you have to do is click on the QuickCapture button (if you have a gps turned) or additionally click the map to place the feature. 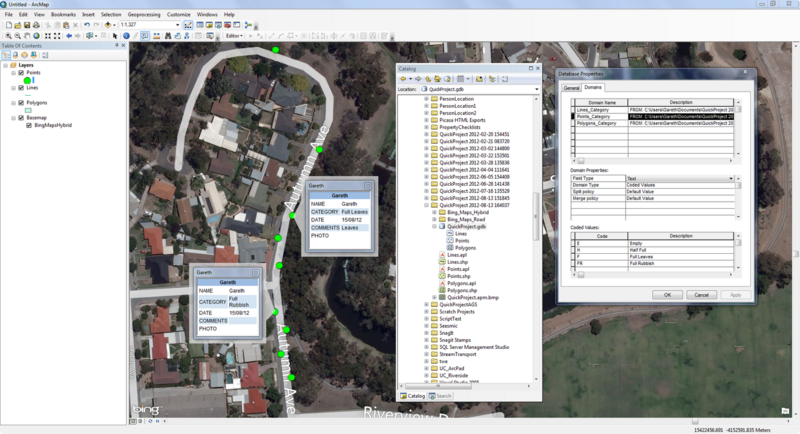 As you can see within ArcPad there is actually a lot of flexibility to assist in building rapid data collection projects, for some this task could be used as a pilot study to then use to build a Geodatabase. Well guess what. We can help you there too. In the ArcPad Geoprocessing Toolbox of ArcGIS for Desktop there is a nifty little tool that can convert all that good work with your QuickProject into a Geodatabase aptly called “QuickProject to Geodatabase”. The tool will not only convert the shapefiles into Geodatabase feature classes, it will create and associate the coded value domains that from the categories you set. Note this script was originally written as a Python sample to show what could be done, so feel free to open the python code and edit it to best fit your needs. You can load these new feature classes into ArcMap and continue to build upon your fantastic mobile Geodatabase design from ArcPad. And there you have it. Not only is ArcPad fantastic data collection software but it can also help you build data from scratch to develop enterprise data. Throw in a couple of fantastic, easy to use tools to help increase your data capture techniques and it's fun for all the family (or organisation). Very nice addition to ArcPad! I always liked how Trimble'sTerraSync added point_generic, line_generic, and so on for ad hoc data collection, but this takes THAT much further. Anyone who does field data collection knows they constantly run into the uneexpected and don't have the time to remember how to make edits to the features. This will really help.